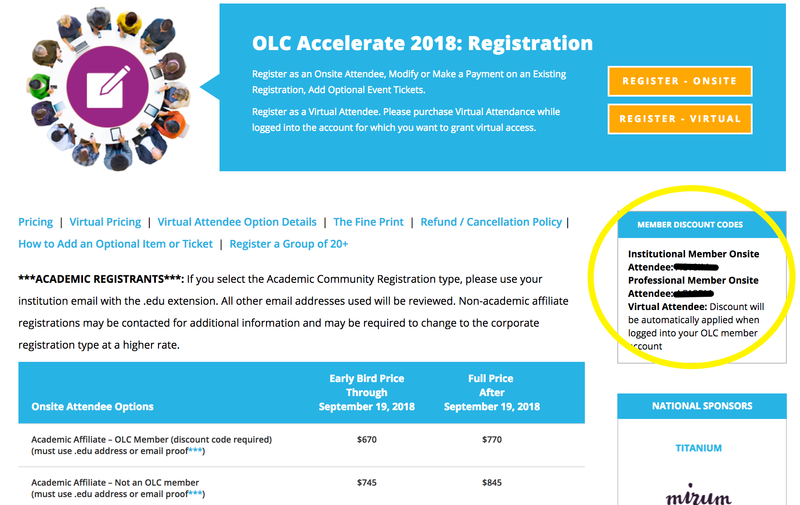 OLC Accelerate: Where Do I Find the Member Discount Code for Conferences? Professional and Institutional Members receive discounts on OLC conferences. Once logged in, you will see the member discount codes in a box on the right hand side of the conference specific registration page (see screenshot below.) The code will need to be entered on the payment page during the registration process. What If I don’t see a code? 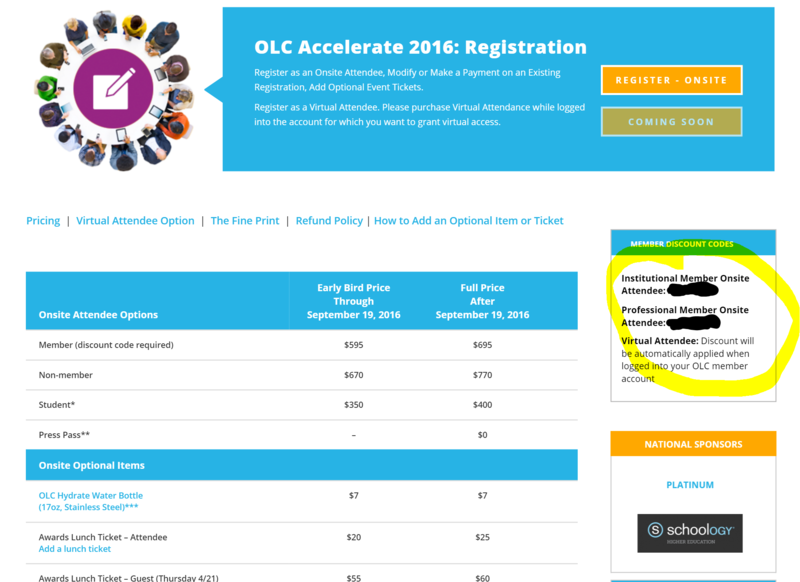 Professional and Institutional Members receive discounts on OLC conferences. Check to make sure your account is set up with the correct membership. Is my institution a member? Check the Institutional Membership Directory to see if your institution is a member. If your institution is a member, please set up a user account and associate it with your institution or make sure your existing user account is properly affiliated by following the instructions below. How do I create an account affiliated with my institution? Once you complete your registration, you will be sent an e-mail and asked to verify your account. Once logged in, click on “My Account” in the upper right hand corner of the home page. You will be brought to your “My Account” page. I already have a user account. How do I make sure I am affiliated with my institution? Once your Institutional Account is set up, you should see the discount codes as shown at the top of this page. Am I a Professional Member? Log into https://onlinelearningconsortium.org/ with your username or e-mail and password. If you don’t know your password, please use the password request link. Go to the community member page https://onlinelearningconsortium.org/join/free/. Now that you have verified your membership, please see the screen shot and information below on where to go to see the code. Once your Account is set up, you should see the discount codes as shown at the top of this page. Please contact conference@onlinelearning-c.org if you have any questions.